Properly maintained exterior wood doors can be a beautiful addition to any home increasing not only its aesthetic appeal, but its market value as well. Performing an inspection of all six sides of the door at least once a year and another few simple steps every couple of years as needed can help keep these doors in tip-top shape for the lifetime of a home. The maintenance procedure is basically the same whether the door has been painted or kept more natural looking and coated with a clear finish. Environmental moisture, blowing dirt and sand, and intense sunlight will have an impact on a door’s finish and since the finish protects the wood, it’s important it remain in the best possible condition. Generally, exterior wood doors not protected by an overhang or porch will weather faster than a covered door. They should be inspected more often. Large cracks in the finish, surface checks and peeling paint are all obvious with a visual inspection. Their presence generally equates with restoration work. A raised wood grain with a dry rough feeling to the door also means the finish is beginning to fail and needs to be reapplied. Dark streaks in the wood under a clear finish or a light or whitish haze to the finish itself may mean moisture is getting into the door and the finish is failing. 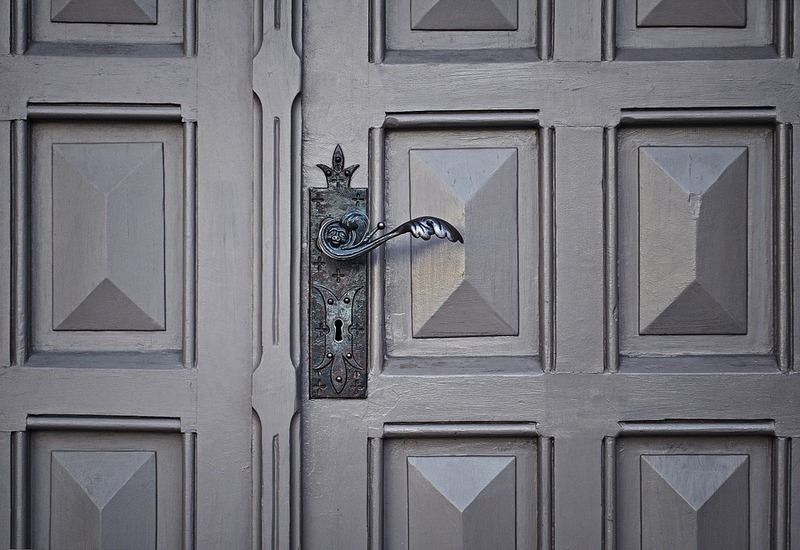 Once a problem has been identified, the exterior wood door should be prepped for repair. It should be thoroughly cleaned. If it has been painted, small wear spots and other chips can be touched up or the entire door can be recoated while it still in the frame. 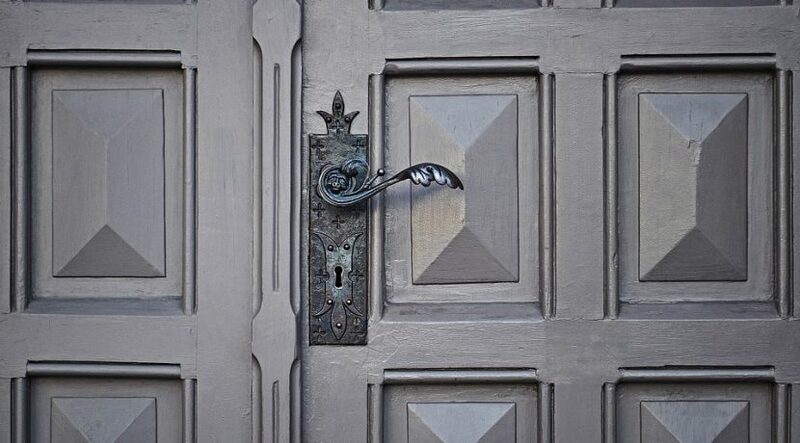 For major finish restoration, however, it is generally easier to work on a door out of the frame. This can be done by tapping out the hinge pins and placing the door across supports such as sawhorses. The door’s hardware, including knobs, locksets and hinges can be removed with a screwdriver and placed in a safe place while the door is being worked on. All six sides of the door should be stripped of old finish using a quality paint remover or finish stripper according to product directions and then gently sanded using a 120, 150 or higher grit sandpaper. All sanding should be done with the grain. Once the door has been stripped it should be cleaned of all dust and sanding residue with a clean cloth slightly damped with mineral spirits. Allow the door to dry completely. If the door is to be repainted, a good quality exterior primer should be applied on all six sides. Once dry, the door can be recoated with exterior grade paint. Because dark colors absorb heat, light colors will often last longer. If another finish is to be used, two or more coats of quality polyurethane with a UV inhibitor can be applied. It is important to follow all manufacturer’s directions. Once dry, the hardware can be replaced and the door rehung. All rights reserved to the initial publisher for Do it yourself.